Happy New Year! I launched into 2019 with a bad cold which had me couch-bound in a sea of crumpled tissues. Too bleary to act on ambitious resolutions, I watched other people achieve theirs by way of the popular Netflix series Tidying Up with Marie Kondo. Kondo is the spritely Japanese organization guru who encourages her clients and readers to only keep objects that “spark joy.” Watching the show, you realize there’s no one-size-fits-all joy. One episode features a woman who collects holiday nutcrackers (though not all Christmas-themed) that sprawl across her basement family room. Banker’s boxes containing her husband’s baseball collection fill her bedroom. As a viewer, it’s easy to look at someone else’s stuff and yell “toss it all!” But as they say, one person’s trash is another person’s treasure. If white knight Kondo showed up on my doorstep with her black squire translator, she’d find our treasure/trash on our bookshelves. MJ and I read a lot. Always have. And though we pared down our books dramatically when we downsized, we keep reading. Built-in office bookshelves overflow with research and reference books. 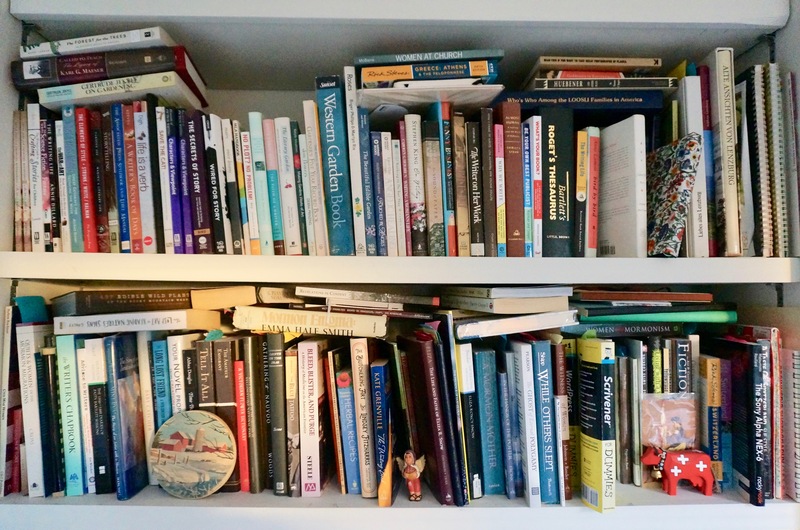 The kitchen bookshelf is crammed with cookbooks. A large wooden bookshelf in the living room holds novels, poetry, piano books, and display-worthy design books. (Though many live on the floor behind the sofa.) Books are piled so high on our bedside tables they threaten to topple over and bury us in the night. One woman’s second copy of Middlemarch is another woman’s Darth Vader nutcracker. I recently Kondoed my night table by separating the books into categories and placing them in boxes in a little bedroom alcove. But MJ’s pile still loomed large. For Christmas, I gave him a white Story Bookcase from DWR. It stood unopened in our garage until MLK Day weekend when it took up residence in the same little alcove as my boxes of books. Empty, it looked like the spine of a small dinosaur. I was on the road to recovery and MJ was home from work, so it seemed like a good time to Kondo his night table books. Kondo says to tap books in order to “wake them up” before you begin sorting. MJ didn’t tap them so much as toss them from his night table to the floor. But maybe that helped, as it wasn’t too painful to sort them into “giveaway” and “keep” piles. By the end of the day forty books and a dozen literary journals rested on the new bookshelf’s vertebrae. Looks so good in our new library alcove, I’m tempted to buy another bookcase for my boxed books. Only one P. G. Woodhouse volume—the one he’s currently reading—remained on his night table. The next morning he woke up energized by the transformation. But he also dreamed he’d slipped out of bed without the book stacks to bolster him. Kondo says you shouldn’t keep more than thirty books in your home. We’re a far cry from that. But at least we own thirty fewer books. Of course, new books will always call to us. This weekend we’re looking forward to the International Antiquarian Book Fair happening here in Oakland. On our last visit I snagged a 19th century anti-Mormon novel with a salacious embossed spine showing a man lashing a whip over a woman coerced into polygamy. Given that my own novel explores 19th century polygamy, that sparked joy! Has Kondo’s book or television series inspired you to tidy up? How do you stay on top of your books? This entry was posted in Shelter, Spirit, Style and tagged books, clutter, kondo, Marie Kondo, New Year's Resolutions, organization. Bookmark the permalink. Post a comment or leave a trackback: Trackback URL.